Mikaela Shiffrin often finds herself fixating on two thoughts that are completely detached from reality. Really? 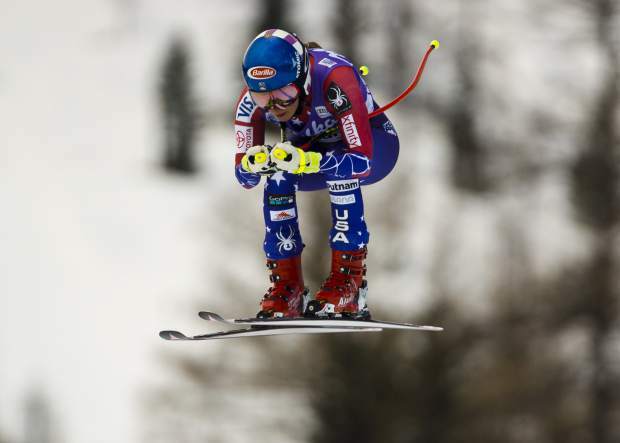 She is, don’t forget, an athlete who claimed the first five events she entered in 2018, a record, before a third-place showing in a downhill Friday at Cortina d’Ampezzo, Italy. She has won eight of her past 10 races. This 22-year-old American, still presumably far closer to the start of her career than the end of it, regularly worries about no longer finishing first? That, Shiffrin explains, is why she puts in all of the time and effort to stay on top. The extra ski runs — double sessions lasting four to five hours on each of four consecutive days during a recent “off week” — and the video studying — 30 minutes to 1½ hours a day — and the fitness training and everything else. “Her hard work is harder than anybody else out there,” Day said. And that, in turn, is why Shiffrin has established herself as the best Alpine ski racer there is at the moment, someone who is expected to be one of the faces of the Pyeongchang Olympics, which open Feb. 9. “That’s why my team — my mom and my coaches and everyone around me — pushes me to train hard. They know that slacking off never got anybody to win anything. And if I stand still for a second, everybody else is moving forward, so they’re going to surpass me,” said Shiffrin, whose mother, Eileen, travels the circuit with her, serving as a coach and sounding board. She made that quite plain to the world at the Sochi Games four years ago. How crazy? The record for most Alpine golds at a single Winter Games is three, accomplished three times previously (Toni Sailer of Austria in 1956, Jean-Claude Killy of France in 1968, and Janica Kostelic of Croatia in 2002). But maybe this will be Shiffrin’s time. In a change from 2014, the giant slalom and slalom — considered the more technical events, and her two best — open the women’s racing, with a three-day gap preceding the shift to the speed races, beginning with the super-G and, after another four-day hiatus, the downhill. Then comes the combined (one run each of slalom and downhill). Simply considering that at this stage of her career is a testament to what a quick study she is. Nowadays, Alpine competitors typically tend to focus either on technical or speed events, not everything. Little about Shiffrin is typical, though. It took her two World Cup starts to earn a top-three finish in a slalom, just three for her first podium showing in a downhill. She won the World Cup overall title last season and is currently on pace for a second. She already equaled a record by earning her 41st World Cup race win before turning 23; Lindsey Vonn, by comparison, had seven before that age. That seems hard to fathom. Until one considers just how seriously Shiffrin takes her craft. She is constantly watching video of her own races and those of others — including six-time men’s World Cup overall champion Marcel Hirscher, who says he studies her, too — to see where there might be a tiny detail that can shave off a bit of time here or there. Part of that comes from within, to be sure. Part of it comes from the way her parents taught her about what it means to have fun. Shiffrin herself talks about wanting to be so ready to get in the starting hut that she can overcome something that isn’t exactly right on that given day. On the day she won her gold medal in 2014, Shiffrin woke up with a cold. She was, not surprisingly, nervous. Midway through her second run, she briefly lost her balance and her left ski lifted off the snow.